First things first, many thanks to Leanne at Healthful Pursuit for this recipe, which I followed in substance if not exactly to the letter. Before moving to Canada I’d never heard of nanaimo bars but I wish I’d encountered them a long time ago. I put them somewhere between a chocolate bar and a brownie, with great potential for versatility on flavor, and I couldn’t pass up on the opportunity to take a shot at making my own. The other thing they have great potential for is hitting various points for allergic or otherwise preferential dietary choices. 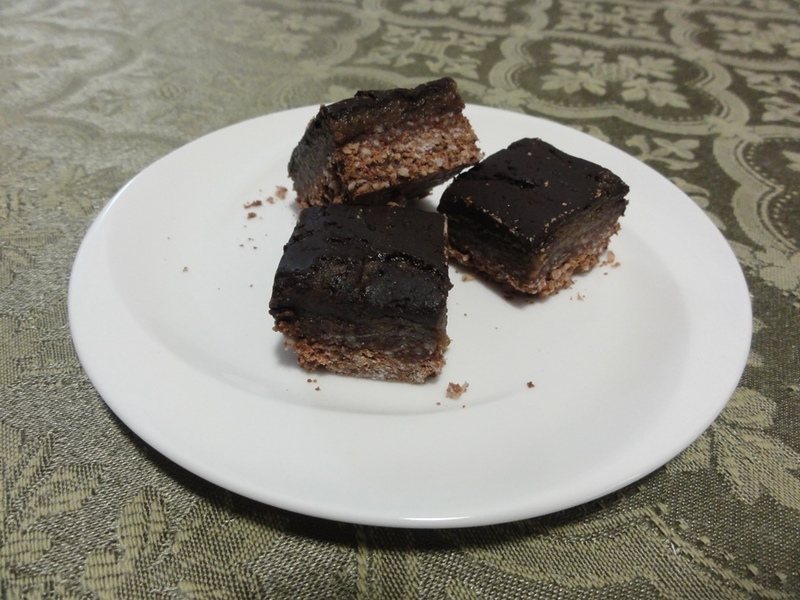 The original recipe hit raw, vegan (and thus dairy-free), gluten-free, and no refined sugar, which is a remarkable feat, but I decided to take a swing at going for five points and added nut-free to the list. The end result needs some work, but hey, that’s why I’m calling this one experimental! That’s what they look like up close, which is to say vaguely what Leanne’s recipe produced but nowhere near as appetizing. The top didn’t quite harden up despite spending all night in the fridge, and sunflower butter just doesn’t look appealing. The crust turned out all right, but it’s still a little too crumbly. So what went wrong? Well, simply put, I didn’t follow the recipe. I played around with the ingredients to exclude the almonds and the xylitol, the former to make the product nut-free and the latter on the grounds that I didn’t feel like buying a bag and I wanted to see what would happen if I sweetened unsweetened chocolate with maple syrup instead. In the crust I substituted maple syrup for the date syrup and coconut flour for the almond flour. 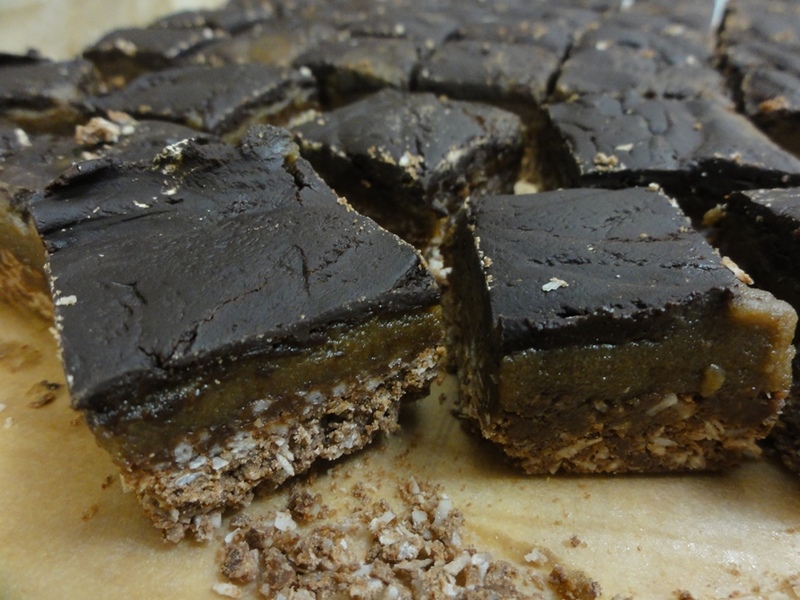 In the filling I substituted sunflower seed butter for the almond butter and coconut milk for the almond milk. In the topping I substituted maple syrup for the xylitol. The only quantity I changed was for the flour because coconut flour absorbs liquid like nobody’s business, a little goes a long way, so I cut that down from 1 1/2 cups to 1, and in retrospect I think I could have gone down to 3/4 cup. Preparation Time: 45 minutes total with about an hour and a half of refrigeration time spread in between. 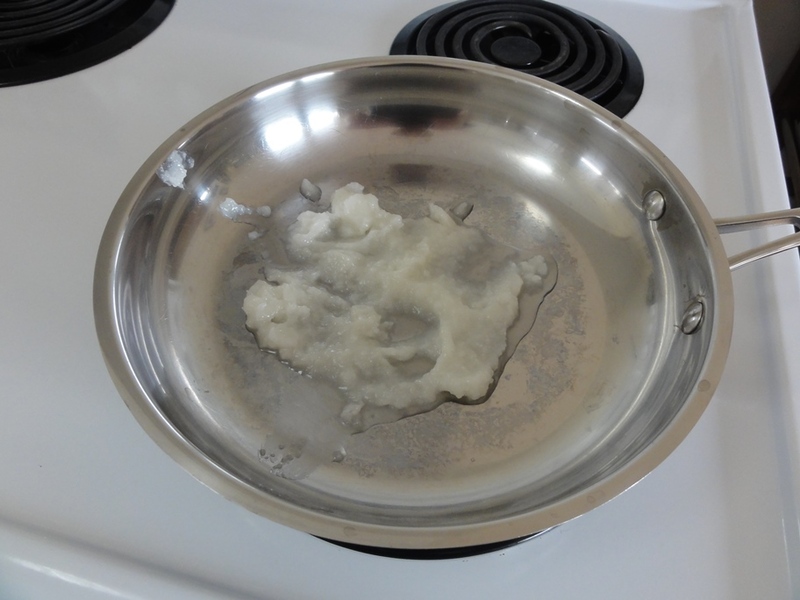 Melt the coconut oil over very low temperature. 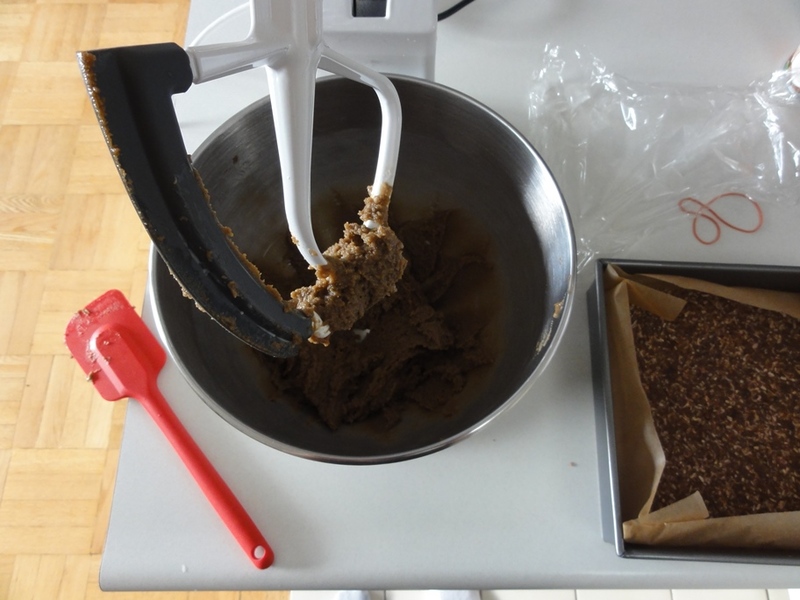 Add in the cocoa powder a little at a time, whisking until smooth. Add the maple syrup and vanilla then whisk until smooth again. Add the coconut flour and shredded coconut and mix until well combined. 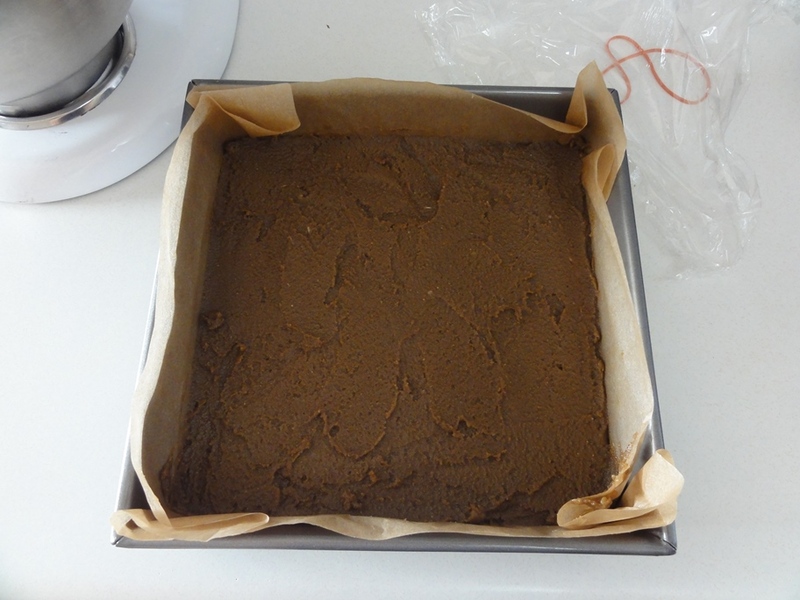 Press the mixture evenly into the bottom of the baking pan. Beat all the ingredients together until smooth; this shouldn’t take more than a minute on low speed. Spread the filling over the bottom layer. 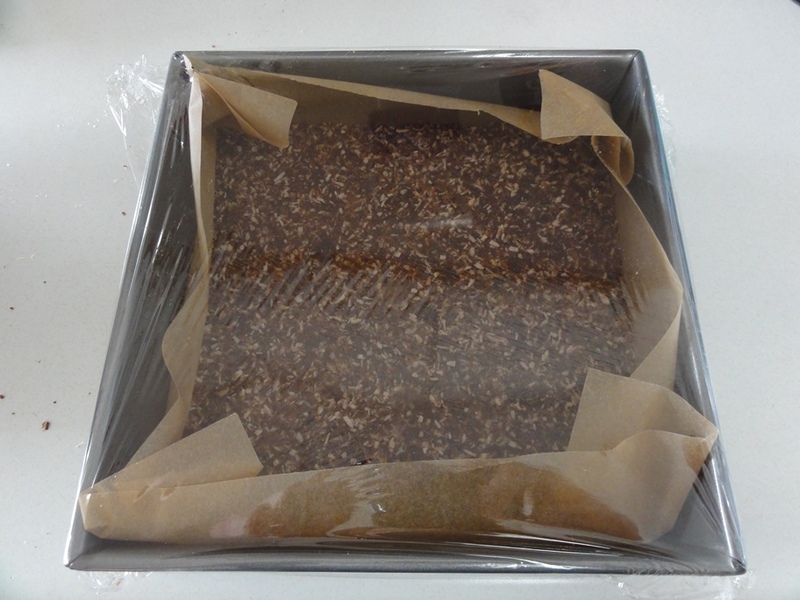 Cover with plastic wrap and refrigerate for 45 minutes. 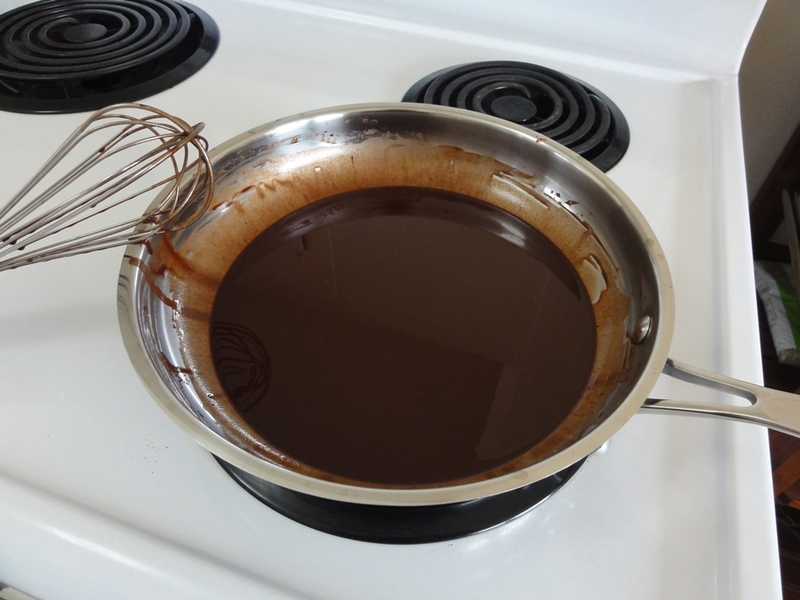 Over very low temperature, melt the chocolate until evenly smooth. Add maple syrup and stir until just combined. Spread the melted chocolate mixture evenly over the filling and refrigerate for about 10 minutes to allow the chocolate to set. 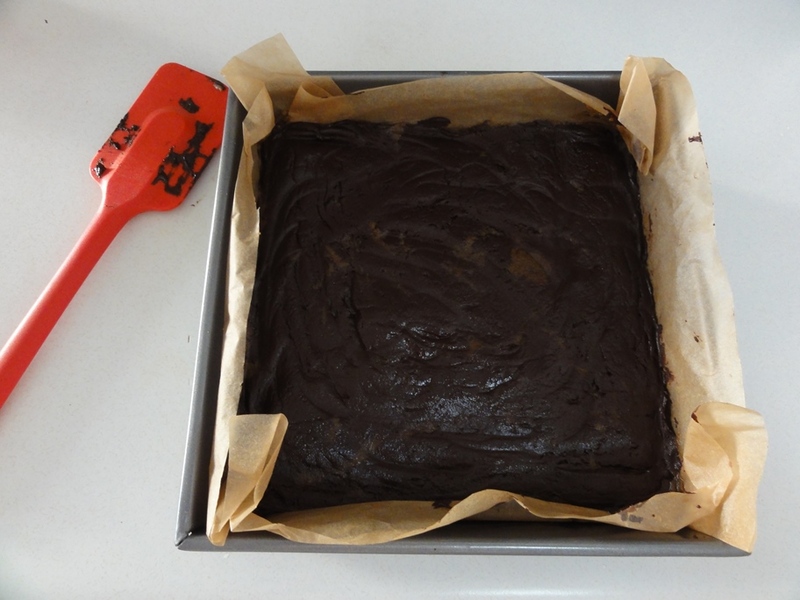 Cut into squares with a sharp knife then cover with plastic wrap and return to the fridge to allow the chocolate to harden. On texture the crust is okay but as I mentioned a little crumbly, which less coconut flour might resolve. The middle is in good shape, fairly smooth and dense enough to hold together. The top is a bit mushy on account of the chocolate seizing when I added the maple syrup. My sister suggested melting the chocolate with a tablespoon of coconut oil to stabilize the chocolate before adding the maple syrup, which I’ll try next time. On taste, the crust is fine, I have no issues there. I was concerned about the coconut flour overwhelming the base because it’s fairly strong in flavor, but that didn’t happen. The middle tastes like sunflower butter, which apparently I’m not that keen on. The top is in good shape too; the chocolate definitely did get sweetened by the maple syrup, so if I could resolve the texture issue I think it’d be fine. I’m definitely going to take another swing at this and so at some point I will write up a hopefully improved version. If the chocolate top can be fixed then this is a solid base with which to vary the flavors. It would raise the allergen count by one but I’m very much inclined to try a peanut butter filling. A vanilla cream filling sounds good too, though I’d lose the vegan-ness unless I could make creamed coconut work there. I don’t know how yet but the combination of textures makes me want to involve caramel. Despite the texture and taste issues there is a definite positive note here; these are quite low in sugar and have some decently healthy ingredients involved. I won’t follow this exact recipe again, but in my never-ending quest for low-sugar, gluten-free, relatively-healthy snack foods, these have answered the call quite well. 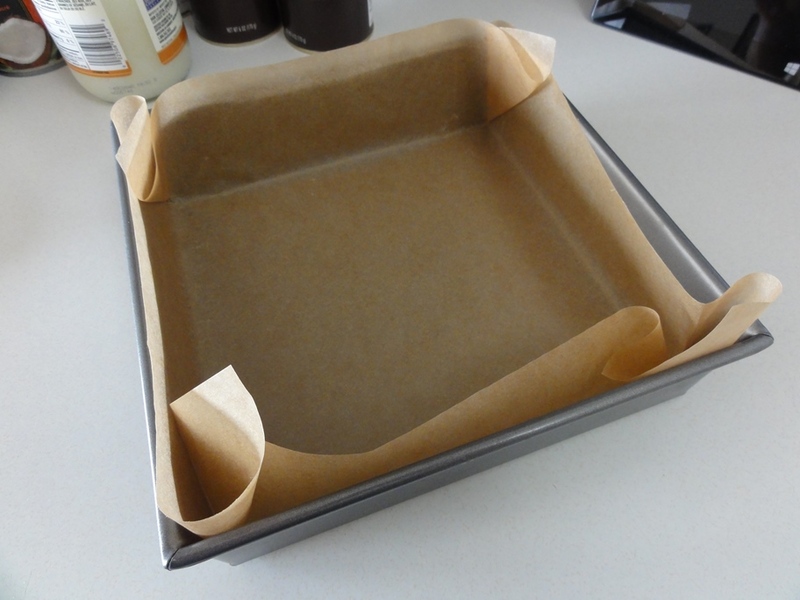 If your parchment paper happens to be wider than your baking pan, you don’t have to worry about the corners. Leanne had a helpful tip though that you can dab coconut oil in the corners if there’s any pan showing. My stove goes from “Min” to “2” as its first two settings, and I had it set roughly in between for melting both the coconut oil and later the chocolate. Coconut oil will melt at very low temperatures, and there’s no need to hurry here. As with melting chocolate, be patient! When the oil has completely melted it will be clear and smooth. 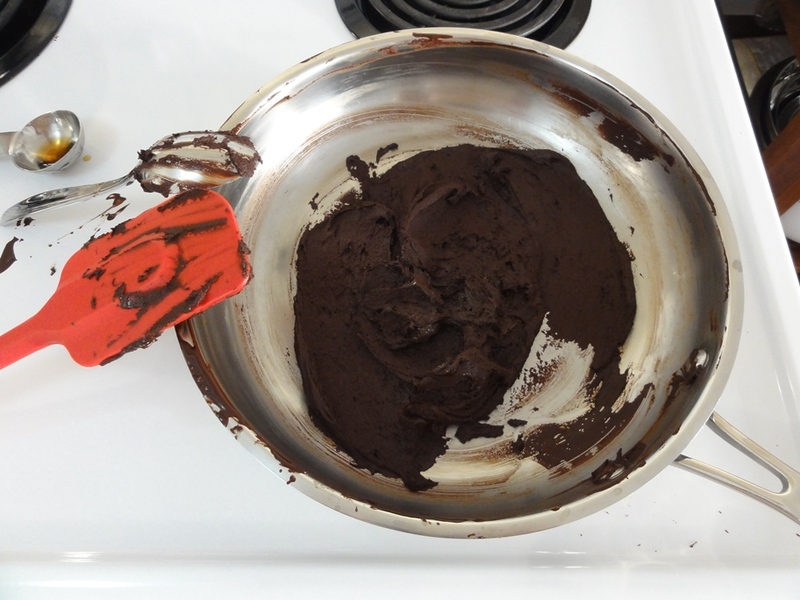 The cocoa powder should then whisk in smoothly, just be mindful to add a little at a time; no more than a quarter of the original amount each time should be fine. Adding the maple syrup and vanilla will thicken the liquid some, and it might not look smooth at first but with gentle whisking it works out. For combining the dry ingredients with the wet for the base, I initially dumped the flour and coconut into the pan and then realized I should have used a deeper pan to make mixing easier. I transferred everything to a bowl and mixed it together, which worked out fine. 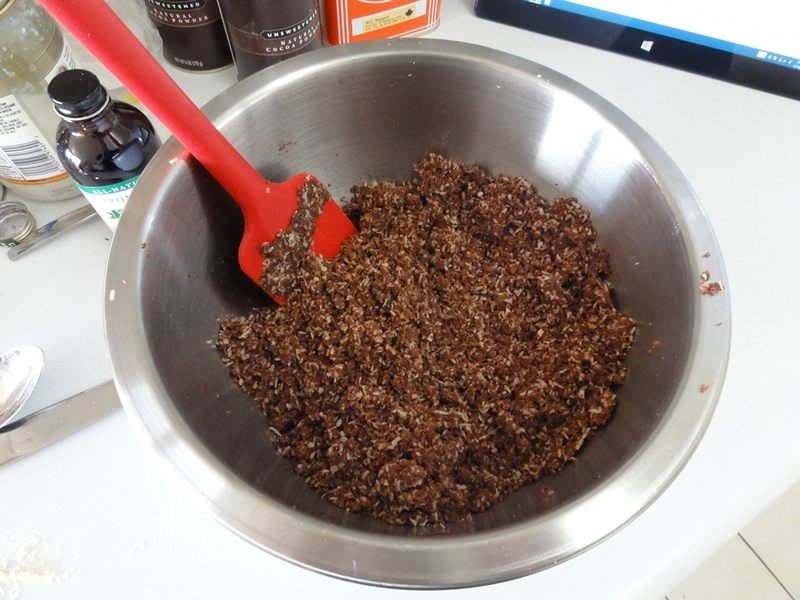 I suggest either using a deep pan so you don’t fling flour and coconut everywhere, or pre-mixing the dry ingredients in a medium bowl and pouring in the chocolate mixture. A wide rubber band helps keep the plastic wrap down if it’s being uncooperative. The filling should easily combine together. Once again, the KitchenAid is overkill and you could easily do this with a spatula or at most a hand mixer. That being said, a thicker butter might be harder to work with, and “overkill” has never been a reason for me not to use the stand mixer. A rubber spatula did the trick for getting the filling more or less evenly spread across the crust. One of my favorite cookie recipes, which I’ve not yet written up here, has the instruction to “break chocolate into pieces no larger than a lima bean” before you melt it. My first reaction was: “How big is a lima bean?”, followed closely by: “Why a lima bean?”, and “Would a kidney bean work?”. 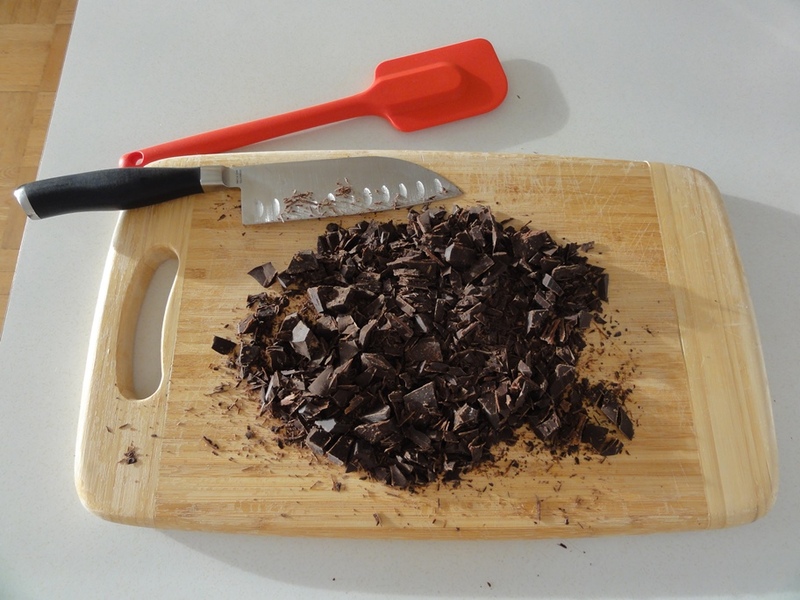 The same set of instructions suggests using a food processor to cut up the chocolate, or if you don’t have one of those, putting the chocolate into a heavy duty ziploc bag and beating the heck out of it with the back of a steel pan (not quite those words). Perhaps you can see why it’s one of my favorite recipes. In any case, I just used a knife and went for lima/kidney/navy bean size. 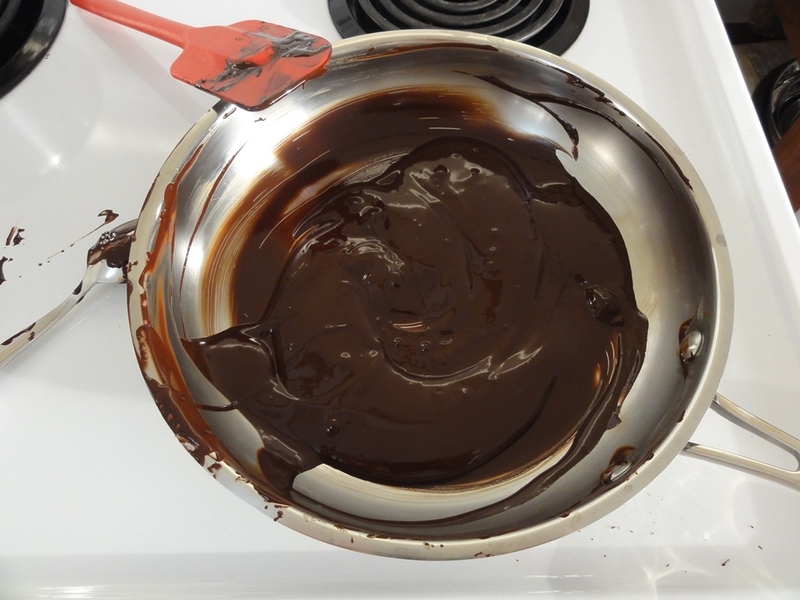 I can’t say it enough: be patient when melting chocolate! A very low temperature setting on your stove is best, and stir often. 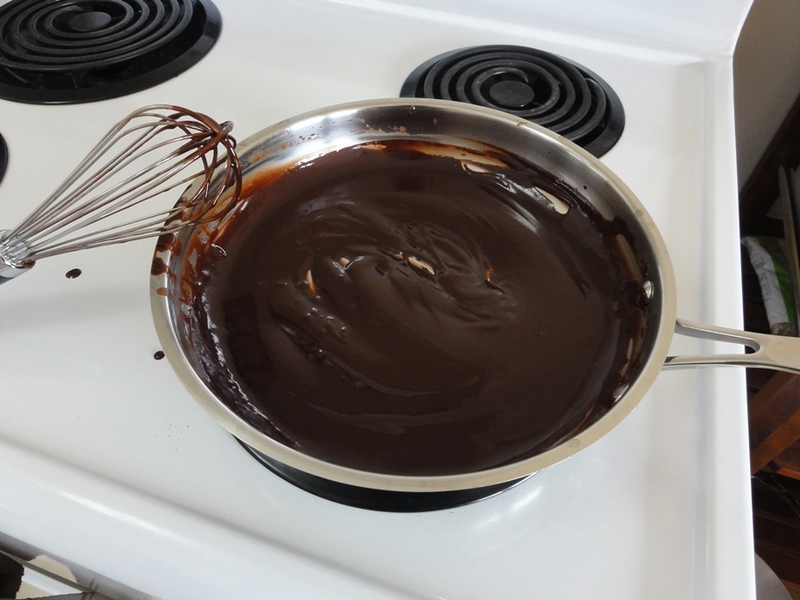 A spatula is a good choice so that you can clean the sides and bottom of the pan while stiring and ensure a smooth combining of the chocolate as its melting. Here’s where things went wrong for the topping. The fat in the warm chocolate seized up when the liquid was added, resulting in a paste that was tasty but hard to spread. With some persuasion I managed to get it relatively evenly spread over the topping, but as you can see some of the topping got picked up by the maple-chocolate-paste and wound up on top. If the topping had still been liquid I’d have been able to just pour it in, making this part somewhat easier. 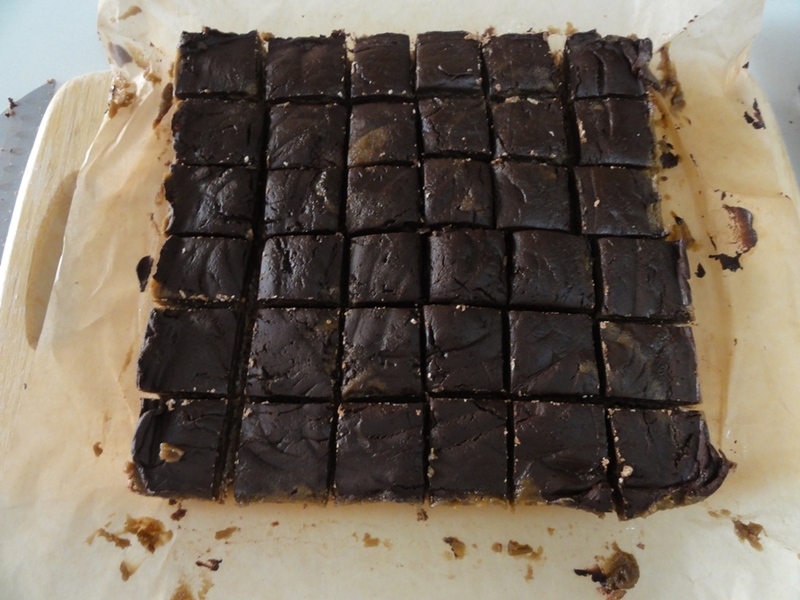 The original recipe called for breaking the batch into 16 squares. In the interest of deceiving myself by making them small and thus rationalizing that it’s okay to eat several, I went for 36 squares instead. The top did set up enough so that cutting wasn’t a problem. To make chopping easier I recommend a knife with a tall blade that clears the height of the bars; something like a santoku or butcher’s knife should do. While these were not entirely successful I’m emboldened to keep experimenting and resolve the issues I ran into, and see if I can work out a combination of ingredients that keeps the five point allergenic/dietary rating while still being tasty and appetizing.